Knighthood is usually conferred for public service; amongst its recipients are all male judges of Her Majesty's High Court of Justice in England. It is possible to be a Knight Bachelor and a junior member of an order of chivalry without being a knight of that order; this situation has become rather common, especially among those recognised for achievements in entertainment. For instance, Sir Ian Holm, Sir Michael Gambon, Sir Derek Jacobi, Sir Anthony Hopkins, Sir Elton John, Sir Michael Caine, Sir Barry Gibb and Sir Ian McKellen are Commanders of the Most Excellent Order of the British Empire (CBEs); Sir Patrick Stewart, Sir Tom Jones and Sir Van Morrison are Officers of the Most Excellent Order of the British Empire (OBEs) (as were Sir Bruce Forsyth, Sir Alan Bates, Sir Robert Helpmann, Sir Nigel Hawthorne, Sir John Mills, Sir John Hurt, Sir Christopher Lee, Sir Peter Ustinov, Sir Alec Guinness, Sir Richard Attenborough, Sir Michael Hordern and Sir Michael Redgrave during their lives); while Sir Paul McCartney and Sir Richard Starkey (Ringo Starr) are Members of the Most Excellent Order of the British Empire (MBE). None of them would be entitled to use the honorific "Sir" by virtue of their membership of the order alone, but as they are all also Knights Bachelor, they are entitled to preface their names with that title. Like other knights, Knights Bachelor are styled "Sir". Since they are not knights of any order of chivalry, there is no post-nominal associated with the honour. When the style "Sir" is awkward or incomplete due to a subsequent appointment, recipients may sometimes use the word "Knight" or "Kt" (note the lowercase 't', which distinguishes it from "KT", the post-nominals of a Knight of the Thistle) after their name in formal documents to signify that they have the additional honour. This style is often adopted by Knights Bachelor who are also peers, baronets or knights of the various statutory orders. Upon an oval medallion of vermilion, enclosed by a scroll a cross-hilted sword belted and sheathed, pommel upwards, between two spurs, rowels upwards, the whole set about with the sword belt, all gilt. In 1974, Queen Elizabeth II issued a further warrant authorising the wearing on appropriate occasions of a neck badge, slightly smaller in size, and in miniature. In 1988 a new certificate of authentication, a knight's only personal documentation, was designed by the College of Arms. 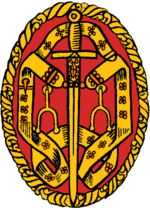 The Imperial Society of Knights Bachelor was founded for the maintenance and consolidation of the Dignity of Knights Bachelor in 1908, and obtained official recognition from the Sovereign in 1912. The Society keeps records of all Knights Bachelor, in their interest. ^ "The British Honours System". www.churchill-society-london.org.uk. Retrieved 23 May 2017. ^ "Imperial Society of Knights Bachelor". www.iskb.co.uk. Retrieved 23 May 2017. ^ "Orders of Chivalry". British Government. Archived from the original on 19 August 2007. Retrieved 30 August 2007. ^ "Form of address". Imperial Society of Knights Bachelor. Retrieved 17 April 2014. ^ "Knight". Forms of address. Debrett's. Archived from the original on 5 April 2014. Retrieved 17 April 2014.